"Beautiful!" is all what my neighbors could mutter as they pass by our house and see the flower clusters of Garlic Vine (Mansoa Alliacea) cascading down the front fence. This year, the masses of flowers was truly exceptional. And what's nice about this is that there have been three waves of flowering since last month! Initially, I assumed that the succeeding waves of flowers were all from new branches that have grown. After all, some web sources suggest to not overly prune because flowering occurs on new growth. After the Garlic Vine's initial flowering, the mature flowers that have become pale will start to wither and turn brown. Soon, the whole flower cluster will look like it's become totally dry. Compared to the previous spectacular show of purple and lilac colors, what's left is drab display of brown and withered flowers. The flowers actually become soft and droopy. One by one, they just fall - sometimes days apart. It's a slow process and virtually every day, you'd seen fallen withered and brown petals of the garlic vine flowers on the ground. And here's what's left of the cluster on the branch when the flowers start to fall. So as not to keep sweeping off the withered petals and flowers everyday, I decided to cut off the flower clusters all at the same time - yes, all of them. If in the past I would hard-prune the vine, this time, I didn't cut any branch. I just located the peduncle (stalk that connect the flower clusters to the branch) and trimmed off the flower clusters. 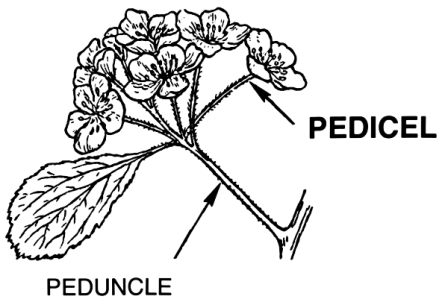 Shown below is a diagram showing a peduncle of a cluster. After a few weeks, I was surprised to see that there were new flower buds that were developing in the same nodes where I trimmed off the old flower clusters. Here's a photo of a cluster taken from the new batch of flowers. Looking closer at the base, you'd see that the flowers developed on the same nodes where I earlier trimmed off the old batch of flower clusters. The photo below show the peduncles still attached at the nodes. They have become dried and now brown. Yet on the same nodes, new flower clusters have developed. How many peduncles of flower clusters could possibly grow from that node? There must be a limit to the waves of flowering on a branch and I'll find out soon. Initially, I surmised that the waves of flowering were attributed to the vine's maturity. After all, this garlic vine has been with us for over three years now. Most vines have become robust and vigorous by that time. Then I also realized that while keeping the vine tidy (by cutting off spent blooms), I was also deadheading to promote flowering. Certainly, flower buds are not only expected on new growth as some would suggest, but also on the still semi-woody parts of the plant. Do you have any thoughts about the cold hardiness of Mansoa Alliacea? We live in Northeastern Florida where the temperature can occasionally reach 28-29 F for short periods. Does the hardiness improve as the vine ages? Thank you. From plantsrescue.com: "Mansoa alliacea prefers a sunny to half shady site and can withstand temperatures only above 1-2º C (34-36°F )." Temps rarely drop below 20 deg Celsius from where I am, so we never have problems. As far as hardiness improving with the vine's maturity, I've no idea. Thank you for your reply. We will have to plan for better protection!